The Food Guide Pyramid, which was released by the USDA in 1992, was replaced on April 19, 2005, by MyPyramid. The original Food Guide Pyramid, like MyPyramid, was a widely recognized nutrition education tool that translated nutritional recommendations into the kinds and amounts of food to eat each day. In this video I discuss how to read food labels and what all of the sections of the label are telling you. Food labels can be tricky, so it is important to understand what these labels are actually telling you. The Nutrition Facts Label can be broken into 5 parts; 1) serving size, 2) calories, 3) amount of nutrients, 4) Percent daily value and 5) the footnote portion. The serving size section tells what 1 serving size actually is, and the total amount of servings in the container. Serving sizes are usually standardized to make it easy to compare similar foods. For instance here are 2 food labels for organic soups, black bean vegetable on the left, chunky vegetable on the right. You can see both list a serving size as 1 cup or 245 grams. Next is the calories section. Calories are a measurement of energy from food for your body. Here we have the nutrition label for Lucky Charms cereal. Most people grab a bowl, and fill it up near the top, then add in milk paying no attention to serving size. But, 1 serving size is actually ¾ of a cup of the cereal and ½ cup of non fat milk. According to the serving size section, this would provide 150 total calories, 110 calories from the cereal and 40 calories from the milk. The full bowl of cereal and milk totaled 448 calories. So, 150 calories vs 448 calories, quite a difference. The next section lists the amount of nutrients in a serving size. Here you will see the macronutrients, Fats, carbohydrates and protein. Macronutrients are what provide calories, or energy for your body. Other items listed usually include cholesterol and sodium, and typically under the carbohydrates section the amount of fiber and sugar are listed. Cholesterol, sodium and sugar are listed because many people over consume these items, and fiber is listed because most people are deficient in it. The percentages on the right tell you the percentage of the recommended amount of each item, in a serving size. These percentages are based on a person consuming a 2000 calorie diet per day. For instance, the black bean vegetable soup provides 5g of fiber, at 20%. This means that 1 serving of the soup provides 20% of the recommended amount of fiber most people need per day. Keep in mind that every persons nutrient needs are different. Percent of daily value is the next section. This section tells you the percentage of micronutrients, vitamins and minerals, in a serving size of the food item. Again, These percentages are based on a person consuming a 2000 calorie diet per day. If we look at the lucky charms label, we see the cereal provides 10% of the recommend daily value of calcium, with the milk that increases to 25%. So, one serving size of the cereal with the milk will provide 25% of the recommended amount of calcium most people need per day. Again, Keep in mind that every persons nutrient needs are different. The last part of a food label is the footnote section. Percent daily values are based on 2000 calorie diet. This statement appears on all food labels, as you can see on this cracker label and on this yogurt label. The remaining portion you see on the yogurt label will appear if the size of the label is large enough. The recommended daily values are listed for several nutrients, and are based on public health experts’ advice. They are listed for 2000 and 2500 calorie diets. The recommended daily values change for the energy nutrients, but stay the same for cholesterol, sodium and potassium. You can also see that the recommendations for total fat, saturated fat, cholesterol and sodium are listed as less than, meaning that these are maximum intake recommendations. I will say this for a 3rd time, only because it is extremely important, every persons nutrient needs are different, an athlete, a runner, or someone that leads a very sedentary lifestyle. All of these people will have different nutrient needs. And that be the basics on food labels. 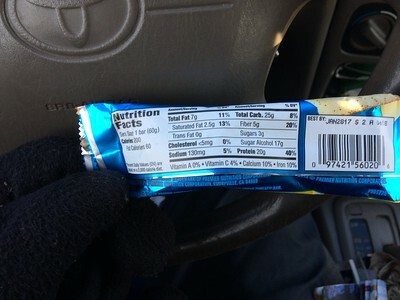 Today I am going to teach you guys how to read nutrition facts labels. One of the best ways to improve your health quickly is by learning how to read nutrition labels. The first thing you’ll notice at the top of nutrition facts are the serving size and servings per container. 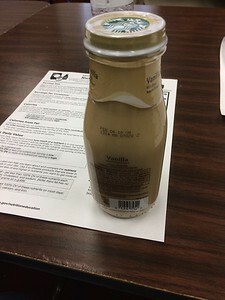 This is simply the “amount” in the package or container. Next you have the ingredients. Everything inside these black lines is representative of ONE serving. This is important to understand because, next you will see the calories and the calories from fat. This is a clever little marketing trick that you should pay attention to. 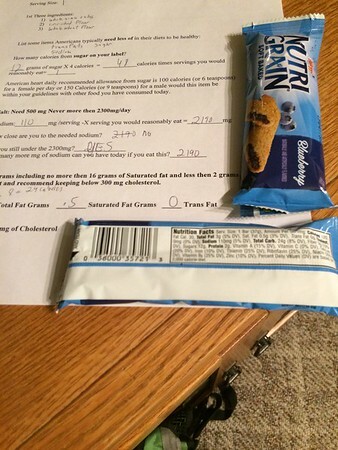 Pressing on, you will see the total fat on the package along with a number and a percentage on the right hand side. The number represents the total fat in one serving and percentage represents the percentage based on a 2000 calorie diet. So 8 gram is 12% of a 2000 calorie diet. I should also remind you that fat is not bad for you and there are plenty of healthy foods that are high in fat. What you really want to watch out for is any trans fat. Trans fat is the kind linked to heart disease and all sorts of bad stuff. Avoid this at all costs. Saturated fat should be much less of a concern. This may surprise some of you, so I will link a few studies below that have conclusively proven that saturated fat is fine to eat and not the cause of the many diseases it was wrongly accused for. Think of saturated fat as the middle child of the fat family, he’s got a good heart but is just a little misunderstood. Where’s the other 7 grams? Well this is because not all fats will be listed on the nutrition label. Only the nutrients deemed most important ever make it to the nutrition labels. The other fats not listed are generally healthy and should be much less of a concern. Pressing on you will see cholesterol and sodium. Remember, these numbers are based on ONE serving. If the sodium was 25% of your daily intake and the package had 2.5 servings in it. That means the entire package contains 63% of you daily sodium intake. Quite a bit considering this is one snack. Onward, you’ll sees the carbohydrate section. Carbohydrates are the breads, grains, fiber and SUGARS in the food. The first section you’ll see is for dietary fiber. Having a good amount of dietary fiber is a good thing as it helps with digestion and satisfaction from meals. Now the next section is what you need to pay attention to. The total sugars in the food you’re eating are important to watch out for as, like the trans fats, these have been linked to a whole host of diseases and health problems. Also you should be aware of not only the sugar in the food, but what kind of carbohydrates you’re eating. If the food is very high in carbohydrates, but low in dietary fiber, even though the carbs are not labeled as “sugar,” they will operate very similarly in the blood stream. This is why you need to watch out for unrefined carbohydrates like white bread and pastas. Next up, you’ll see the label for protein. Knowing that foods high in protein lead to better satisfaction from meals, and promote lean muscle tissue, you will want most of the foods you eat to have a good amount of protein. Finally, we have a few key vitamins at the bottom. It may sound strange, but ignore these. The numbers will be notoriously low and you should be focusing instead on getting in lots of fruits and vegetables every day to meet your vitamin requirements. Leafy greens contain calcium and iron, and fruits contain vitamin c and a. The rest of the nutrition labels facts contain recommendations about how much of each category to get in. They do not change on nutrition labels and are not that important. Finally, on some labels you will see the calories per gram for each macronutrient. Fat contains 9 grams per serving and Carbohydrates and Proteins contain 4. So for every 10 grams of fat, you will have 90 calories. For every 10 grams of protein or carbs you will get 40 calories. Safe to say, you should now have a general understanding of how nutrition labels work. Most importantly, you can stop assuming something is healthy for you based on tricky packaging and start KNOWING the difference. Saturated and trans fats are bad for you. Less than 7% of your total daily calories should come from saturated fats. Less than 1% should come from trans fats. In a 2,000-calorie daily diet, that’s less than 15 grams of saturated fat and less than 2 grams of trans fat. Saturated fats occur naturally in some animal products. This includes meat, poultry, eggs, and dairy items, such as cheese, cream and whole milk. Palm, coconut, and other tropical oils, as well as cocoa butter, contain saturated fat. You should limit saturated fats and avoid trans fats. They often are found in fast food, fried foods, and snack foods. They also can be in desserts and commercial baked goods. These bad fats increase your LDL (bad) cholesterol levels. They decrease your HDL (good) cholesterol levels…. Replace bad fats with good fats. Studies show that good fats can help lower your total cholesterol level. Omega-3 fatty acids have good health benefits. They can decrease your risk of heart attack and inflammation. Monounsaturated fats are found in canola, olive, and peanut oils. They are in a variety of nut oils and butters. Avocados, legumes (beans and peas), and seeds also contain these fats. Polyunsaturated fats are found in vegetable oils like corn, sunflower, and safflower oil. They are in soybeans, legumes, grains, and nuts. Several seeds, like sesame and sunflower, also contain these fats. “.. Both plant- and animal-based omega-3 have their first double-bond in the third position — hence the name “omega-3.” However, the length of the carbon chain of each omega-3 fat makes a significant difference when it comes to bioavailability and biological effect. Marine animal-based omega-3 (fatty fish, fish oil and krill oil) primarily contain docosahexaenoic acid (DHA), a long-chained PUFA consisting of 22 carbons and eicosapentaenoic acid (EPA), which has 20 carbons. Plant-based omega-3 (found in flaxseed, flaxseed oil, chia seeds, walnuts and leafy greens, for example) contain alpha-linolenic acid (ALA), a shorter-chained PUFA consisting of 18 carbons. They are completely devoid of DHA and EPA. How Much Sugar Should I Eat Per Day? *see Health: Nutrition-Micronutrients Pt. 2~Vitamins=Fat Soluble : D & K! “..In order to make sure you’re getting the most out of creating a food diary you want to make sure you’re keeping tabs on the right things. Here are the six things registered dietitians tell their clients about food logging. Related: How Bad Is It To Eat Carbs At Night If You’re Trying To Lose Weight? 1. Set up a method that works for you. Take your lifestyle into consideration, explains registered dietitian Jenny Beth Kroplin. “There are many online tools, apps, and handwritten versions of food journals and trackers that can be quite helpful.” If an app like MyFitnessPal is your jam, go for it. If you’d rather not see the calories, try jotting your food down in a note on your phone or using a good old-fashioned notebook. “..Our research team ranked the best meal replacement shakes below:.. These store-bought and homemade smoothies will help fill you up on the go.